Video content has been proven to increase engagement, conversion, and reach significantly and is consuming the social media universe. Marketers are responding with their wallets, with a plan to increase their mobile ad budgets by 65 percent to account for video, according to a recent infographic by Hubspot. But what promotional strategies should marketers be considering when they think about video? With Facebook, Instagram, Vimeo, YouTube, and more populating video content across every social media channel, innovative marketers and influencers know they need to do more than simply post a video to deliver results, particularly as feeds become more and more video-saturated. Video for the sake of video isn’t enough. Here are a few digital promotion strategies marketers can tap to ensure their video engages their audience in a way that sets them apart and drives results. While these can be done manually, we recommend marketers partner with a digital promotions platform, which can simplify the promotions while ensuring a secure, impartial outcome. User-generated video content allows you to activate brand ambassadors in a way that engages followers and extends reach without having to do much of the production legwork. Host a video contest on Facebook or your website which calls users to submit videos having to do with a product, brand, or theme with a chance to win something great. Participants can enter by recording a video with their mobile devices (or camera, or any other device) and uploading to Youtube, Vimeo, Instagram, or Twitter. Choose a compelling prize that connects to your company and audience to inspire sharing and extend the reach even further. Random selection or sweepstakes: Choose a winner randomly from a list of participants. In order to ensure impartiality, use a third-party platform that can choose a winner, as well as backups in case the winner is unreachable. Voting contest: Empower the community to vote. Facebook voting contests are among the most frequently used actions by brands and companies, thanks to the many benefits provided by these types of contests: energizing the online community, raising brand awareness, extending the reach of communications, and obtaining more fans. Be sure to use a reputable digital promotions platform to discourage practices like vote-buying. For example, The Great Canadian Sales Competition (GCSC) attracts over 2,000 participants across 80 college and university campuses in Canada. While on campus, students film their 30- to 90-second sales pitch to gain entry to the competition. Their entries, including video and profile information, are uploaded to a gallery via their mobile device or laptop. 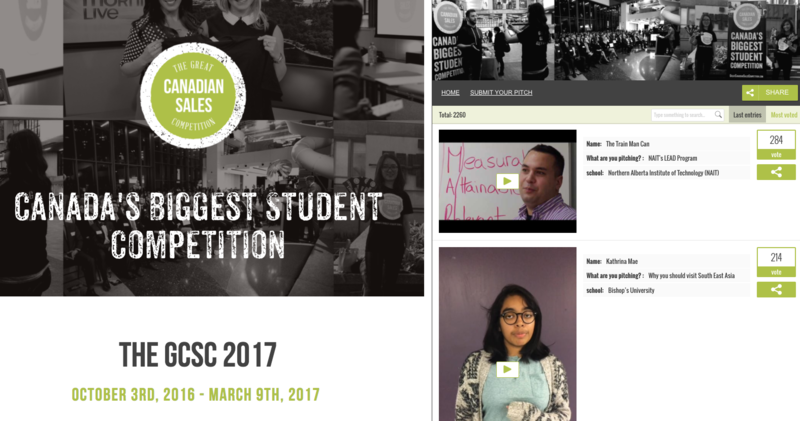 The gallery of contestants is held on the campaign website, GreatCanadianSalesCompetition.com, and students can share their entries to their social channels. To be successful, this campaign requires ease of set up, efficient video upload, fast video streaming, and administrative access to the student data records. Facebook recently announced the launch of a new live video tool, which makes it possible for brands, companies, businesses, and individuals to transmit audiovisual content in real time on Facebook profiles and pages. This offers a tremendous opportunity to foster greater interactions and diversify content and engagement within the Facebook community, while also minimizing the amount of time needed to produce a video. There are several ways marketers can integrate Facebook live video within a digital promotion to increase impact and reach. Sweepstakes, however, offer the greatest opportunity for return. 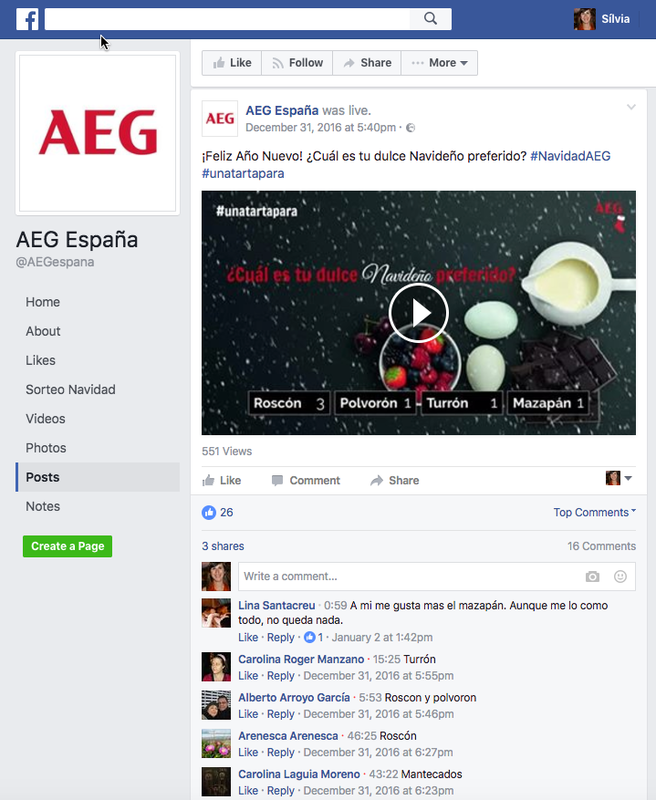 A German brand which produces electrical equipment created a Facebook Live video poll to engage with its online community during a Christmas campaign. It asked which kind of holiday pastries they prefer, and the audience had to comment on the live video poll for a chance to win a prize. Marketers, particularly in retail, are moving to forge agreements with influencers to promote a brand or product via their YouTube channels. These influencers are tasked with finding new methods and content to promote these brands and products on an ongoing basis. YouTube Sweepstakes enable owners of YouTube channels to hold a prize giveaway among people who leave a comment beneath the owner’s published YouTube video. The strategy offers fresh content that extends reach, engagement, and buzz around the products and brands they are promoting on their channel. 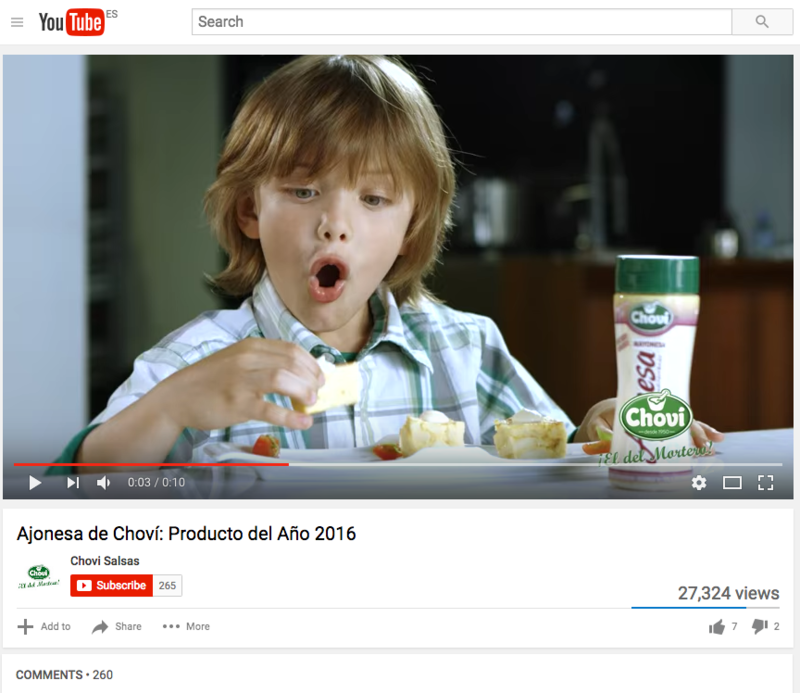 For example, Salsas Choví, which produces sauces and other food products, is very active on social. They publish monthly sweepstakes and promotions to keep their followers engaged in the brand. Taking into account the interests of their target audience, they planned a draw on YouTube, which attracted the attention of the community and encouraged them to participate. The draw consisted of giving away 20 weekend getaways to users who commented directly on the video in the YouTube brand channel. Facebook Timeline Sweepstakes are being used more than ever before. This kind of sweepstakes offers an opportunity for participants to win something by simply liking or commenting on a Facebook post. In 2016, companies broadened its use to not only a post, but a photo or a video as well, offering a gift to a randomly selected user who has commented or liked the broadcasted video. In 2017, the immediacy of Facebook Live will be used to offer a live sweepstakes with the winner announced during the broadcast, thus driving even more engagement and greater transparency in winner selection. 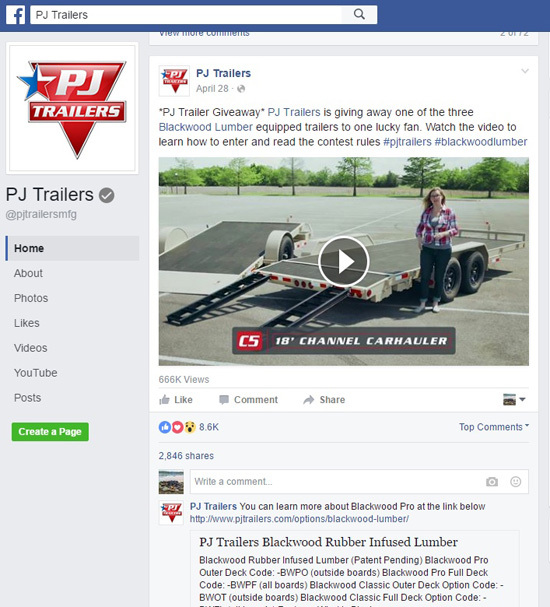 PJ Trailers and Blackwood Lumber teamed up to gain massive engagement among their audience on their Facebook feed. 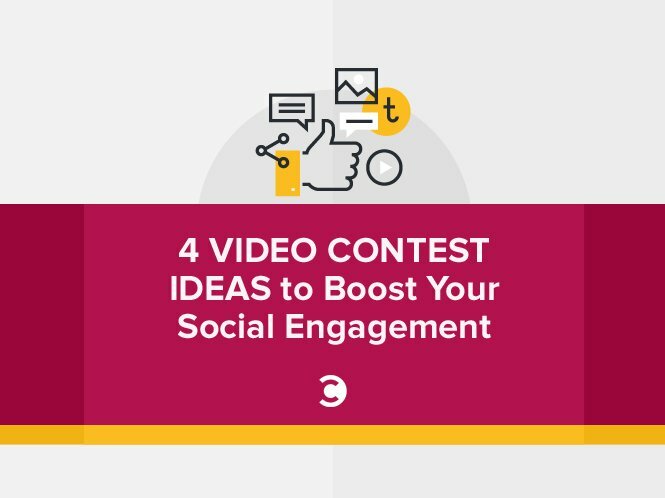 By utilizing a video in their post (versus a static graphic), the company was able to create better engagement with their audience and benefit from Facebook’s preference for showing video content. The combination generated more than 14,800 entries and 665,000 video views, 8600 likes, and 2800 shares—significantly better exposure than reached by normal organic posts. This form of contest is very easy to create and administer, from posting the content to selecting and following up with winners. As video content becomes a central component to marketing strategies on social media, companies, brands, and individuals will need to find more creative, strategic ways to stand out on social media channels. Those that are willing to get creative and identify ways to inspire and engage with their audiences are going to come out on top. Video contests offer proven results, are becoming increasingly popular among marketers, and will continue to evolve ahead of the industry. Marketers who consider them now will have stronger relationships and growing reach to build upon as the popularity of video content grows. Brian McNeil-Smith is the General Manager of Easypromos North America. Easypromos is a social platform used by brands and agencies to create and manage sweepstakes and contests for the purpose of lead generation, audience engagement, and sales growth.